What to do for dinner? Life has been "nuts" all week and I hadn't made it to the grocery store in over a week. I also didn't want anything too fussy. Good thing since the pantry and fridge were running a bit low. After two or three episodes of standing in front of the open refrigerator and then the freezer and then the open pantry cabinets (you know what I'm talking about, don't you? ), I finally settled on the frozen chicken breasts. Grilling was out of the question since my propane tank has been empty for two weeks now having had no time to run to Home Depot for a replacement. I had a good handful left of pignoli's left over from a previous dinner experiment and found breadcrumbs in the pantry. I didn't want anything heavily fried but a fried-like chicken sounded good. With a lack of fresh veggies in the fridge, I eyed the wild rice and knew I wanted to do something with that to compliment the chicken. The key to this "fried" chicken was using my Le Creuset Grill Pan (what a great investment that was!) and finishing it off in the oven. The meal was light and satisfying. I paired it with a lovely chilled Bogle Sauvignon Blanc. Preheat oven to 400º. Preheat the grill pan on low to medium heat (Le Creuset is an excellent heat conductor and doesn't need to be on higher than medium heat). 1. Place a small dry sauté pan on medium heat and place the pignoli's in it to dry toast them stirring them constantly so they don't burn. You want them golden brown as evenly as possible. Remove them from the pan and place in a mortar and pestle and rough grind them. Don't overdo it. You don't want a paste. 2. Split the chicken breasts in half so you have four similar sized pieces. Place them, two at a time, in a gallon sized Ziplock bag and lightly pound them so they are even - about 5/8 of an inch thick (not having a meat tenderizer I use my rolling pin). 4. In a shallow dish, mix together the breadcrumbs, pignolis, cheese, salt and freshly ground pepper to taste. Dip a breast into the slightly beaten egg and then dredge in the crumb mixture. Carefully lay the breast in the pan. All four pieces should fit in the 10" pan. Cook on each side about 3-4 minutes. Very lightly spray the Pam on the top side of the chicken then place the pan in the oven for 8-10 minutes or until the chicken is no longer pink (the Pam helps give that fried-like crunch to the chicken). 2. In a bowl, whisk together the olive oil and lemon. Add the onions. When the rice has finished steaming, fluff it with a fork and then add to the bowl. Toss in the arugula and pecans. Season with salt and pepper to taste. 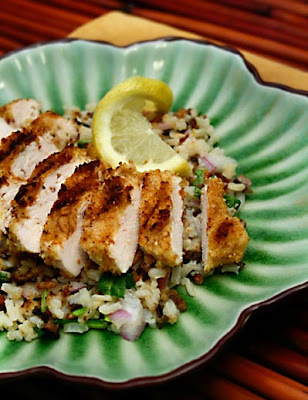 I like this recipe, especially because it looks delicious and easy to make. Can't wait to try it! Thanks! I make variations of this rice often since you can do so much with the leftovers: scramble it with eggs, stir-fry it with chicken and veggies, toss it in a green salad with chicken, ham or turkey and a balsamic vinegarette. That wild rice is excellent - i'd for sure try it but with veggie broth. And the top photo... i'm eyeballing that great plate the food is in. Wow! Gorgeous! i like that grill pan. i'm thinkin' i should invest in one. 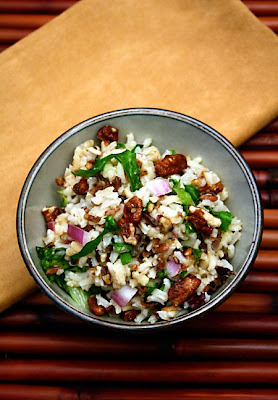 We as a nation absolutely love rice and these recipes are magnificent! Patricia – I know what you mean about rice! Spanish rice was a staple in our family when I was growing up...PS: I did send you an email with my email address.